The luxuries of paved roads and street lights have long been left behind by the time you reach the mountainside homestead of Samuel and Nomsa Lukhele, who head the Hands at Work community organization in Swaziland. The last leg of the journey into Kaphunga is treacherous, taken over roads so deeply weathered with grooves and ruts that you wonder each minute whether your vehicle will make it any further. The winds and twists of the road up the mountain are so frequent you are certain you will never find your way down. About twenty minutes into this body-jarring trek, you start to wonder if people could possibly live here at all; so remote, such a difficult trip, no other cars, no sign of civilization, how could people live here? Another half-an-hour and suddenly people are coming out of the dark night from all directions; women walking down the road, men offering to give directions, and lights peaking through trees are evidence of the living that is taking place here, where you would least expect it. 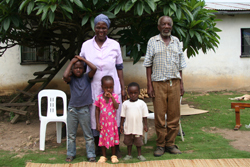 The next day we, a group of volunteers visiting Swaziland for the first time, drive to meet one of the home-based care’s oldest volunteers. Maria makes her way out to the road to greet us. She is 70, we later learn, but she doesn’t look it. She is strong and active. She proudly shows us the chickens she keeps for the orphans served by the home-based care and the wooden tool she uses to make mats out of river reeds and twine; painstakingly sewing each thin reed to another to form a mat for sitting and sleeping. The one she shows us has taken her three weeks to make. And she shows us the children. Three small orphans, a girl and two boys, file obediently to stand beside her. They are Maria’s grandchildren, whom she cares for. These are just the small ones, though, and seven other grandchildren stay with Maria and her husband, Jacob, as well. The ten children, ranging in age from two-and-a-half to eighteen years, are the children of her six deceased children. Only two of her own children are still living, she tells us. Maria does home-based care in the area surrounding her home, visiting fifteen homesteads. Journeying on foot, she checks on the people who live around her, mostly grandmothers, like herself, caring for their orphaned grandchildren. All together these fifteen homesteads house forty-three children. Watching over her ten grandchildren and forty-three other children who live close by, Maria is one woman caring for fifty-three children. In this place where people live great distances apart, where from the road you are unable to see any homes, the vulnerability escapes you. The scenery is so breathtaking, with rolling green hills and flourishing maize crops, that it seems as if there could be no hunger here. As hidden as the people are by the thriving greenery and secluded homesteads, so invisible are their needs. Maria’s story reveals that not until you build relationships with the people, not until you go into their homes and become a constant presence in their lives, do you understand their extreme needs. Maria is a mother to 53 children and a nurse to many patients that, before her, were parentless and wasting away. In the winding, secluded 45-minute drive from Nomsa’s home to Maria’s, how many children did we pass by without even being aware of it? How many orphaned and sick are lost in the crevices and behind the hills of the mountains of Kaphunga, Swaziland?